The mangrove ecosystem is one of the most important to the world’s economies and one of the most endangered. By definition mangroves grow in swamps which are areas that are fully or intermittently submerged but support populations of trees and other woody plants. 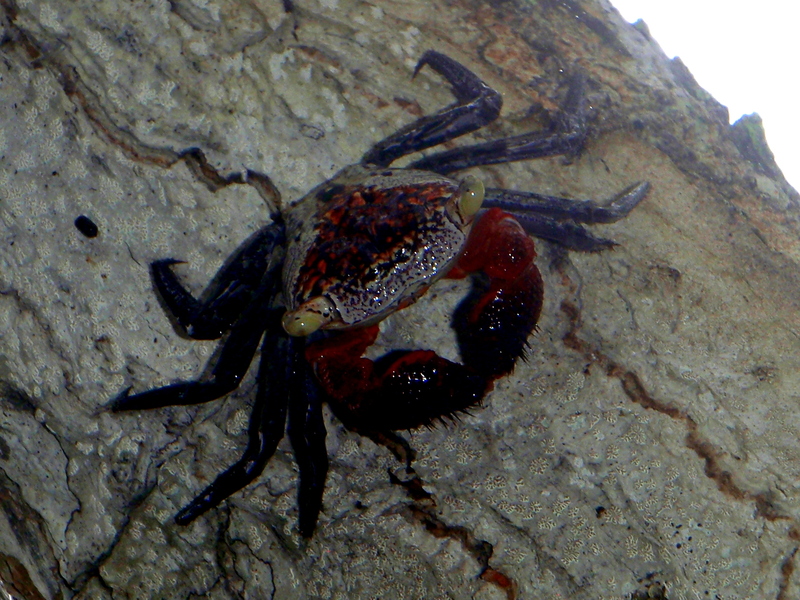 The mangrove tree crab (Aratus pisonii) hops from branch to branch, eating leaves and living out its life in the treetops – they come down to the water only to breed. Different species of mangrove trees have varying salt tolerance and grow in distinct layers where freshwater streams and rivers meet the sea. Moving in from the ocean the first to appear are red mangrove (Rhizophora mangle) which have the highest tolerance, followed by the black mangrove (Avicennia germinans) , and finally furthest upstream the white mangrove (Laguncularia racemosa) which has the lowest tolerance for salt water. The groves of trees are often surrounded by marshes which are areas that are sometimes covered with water but the plants are grasses and herbaceous species rather than trees and shrubs. The trees have a number of unique adaptations to the brackish water they grow in. White and red mangroves have the distinctive aerial prop roots angling out from their base as seen in the photo and black mangroves grow snorkel like pneumatophores which provide air to the roots even when they are completely under water. 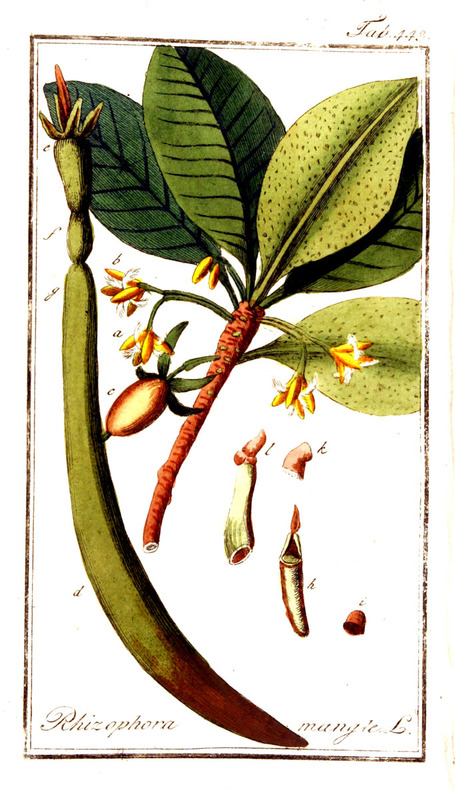 They also excrete salt from their leaves and sometimes on calm cloudy days it can be seen as a mist around the crowns and it can make the leaves of the black mangrove appear white or gray. To avoid confusing species the colorful names refer to the bark and the wood. Mangrove seeds like this one have already germinated when they fall from the tree into the water and can survive for over a year before taking root. In addition to providing habitat to raccoons, tropical cats, sloth and a myriad of birds that are easily seen above the water mangrove forests serve two very important ecological functions under water. First their extensive and interlocked roots protect and buffer the shore collecting and stabilizing sand, leaves and other organic matter into muddy soil. Second and more impressively they are the nursery for hundreds of fish, crab, shellfish and other marine species as well as crocodiles. It’s this function as a nursery which has biologists most concerned because mangroves are being destroyed at a very high rate and some believe that the worlds fisheries may suffer or even collapse without these protected environments where many of the fish caught in the open ocean get their start. One of the biggest threats to the world and Costa Rica’s mangrove forests’ health is pollution. Sediment, industrial chemicals, pesticides, herbicides and fertilizers as well as human and animal waste all run off into the rivers and dump into the swamps. The flow that has been pushing everything downstream slows, stops and even reverses as the tide ebbs and flows and the pollutants fall out. They concentrate in the mud, plants and animals. Excess fertilizer from agricultural applications causes algal blooms (referred to as red tides in the open ocean) that rob the water and its inhabitants of oxygen. The fish and shellfish begin a lifelong accumulation and concentration of toxins and heavy metals with a head start in the high concentrations found in the swamps. Mangrove “swamps” aren’t the most hospitable places for humans. They are alternately flooded with fresh and salt water and where “land” does poke its head above water it’s more like a soup of knee deep pudding than solid land. If you’ve never heard of a head net you’ve never been to the mangrove swamp when the bugs come out. 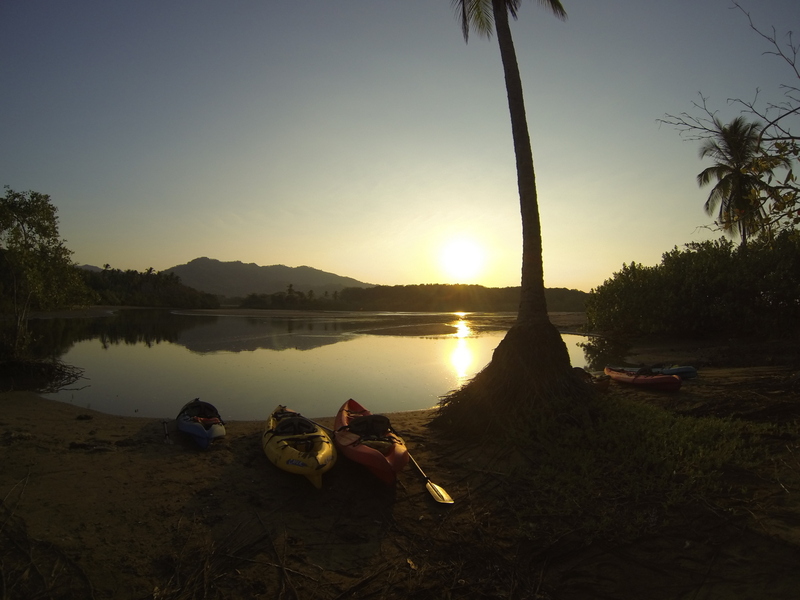 We’ve paddled around dozens of Costa Rica’s mangrove estuaries and only had to don the protective nets once when the blackflies were so thick you could just close your hand and catch 22. Never the less mangroves tend to grow smack in the middle of some of the most desirable real estate in the world. Beaches often form at river mouths where millennia of sediment and sand has dumped into the ocean and mangroves nearly always occupy the deltas and estuaries behind the river mouth in the middle of the beach. If you eliminate the trees and fill in the muck you can make more beach. There was a case in the Costa Rican courts a few years ago where the municipality of Carrillo sued the Riu Resort over the disappearance of several acres of endangered white and black mangroves (Avicennia germinans) in front of the site for the new Riu Palace. We weren’t privy to the court proceedings but the two sides of the story in the rumor mill were that the municipality thought the Riu had illegally bulldozed the trees in the night and the resort suggested that perhaps they simply fell down and washed out to sea…or maybe they were never there in the first place. Having visited playa Matapalo long before the resort began construction I can assure you that there were mangroves. I don’t know what the outcome of the court case was but regardless of any fine paid or apologies made the trees are gone. 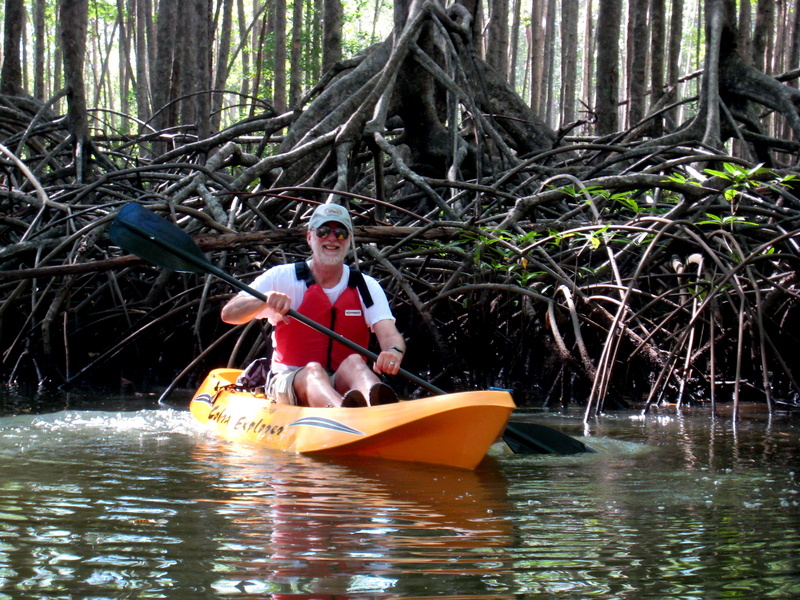 You probably won’t have to travel far to explore a mangrove swamp. We’ve been through forests in the far northwest of Guanacaste at Santa Rosa national park, at Tamarindo north of the beach in Las Baulas National park, Central pacific at Hacienda Barú, the far southwest near Puerto Jiménez on the Osa peninsula and nearly everywhere in between. The largest mangrove swamps in Costa Rica (and one of the largest in the world) are at Térraba-Sierpe just north of the Osa peninsula but small mangrove forests can be found nearly anywhere a river meets the sea. On the Caribbean coast the best examples are in Gandoca Manzanillo wildlife refuge and some smaller areas in Cahuita national park. Most places where significant amounts of freshwater flows into the ocean in Costa Rica there will be an estuary that was at one time surrounded by mangrove swamps. It’s not advised to try to visit on foot as you’ll spend a lot of time up to your knees, waist or even armpits in muck. Gliding along on kayaks is the ideal way to visit. 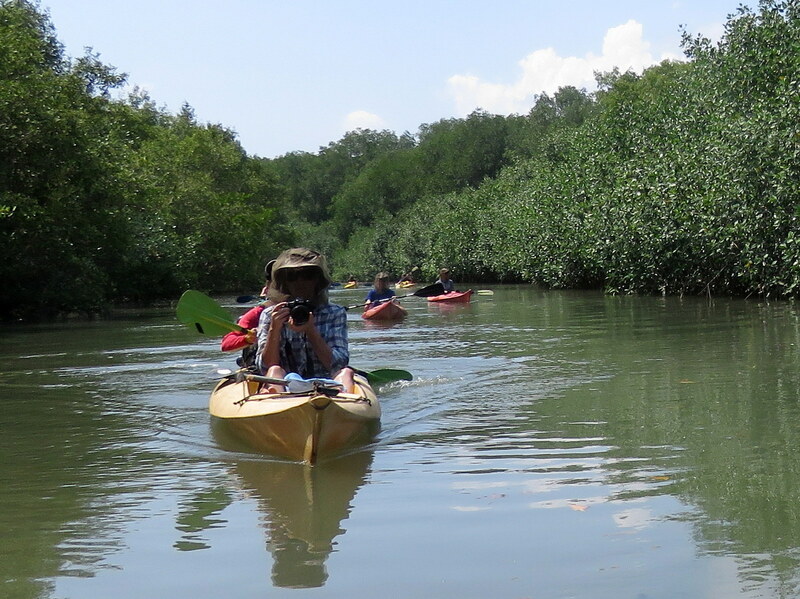 Recently we took a couple of mangrove tours and discovered that it is possible to ruin the mangrove experience. The name of the worst tour company is Arenas and they operate out of Tamarindo (see http://www.tamarindoaventuras.com/). The tour was horrible. Not only by far the worst mangrove tour (out of dozens) that we’ve ever done but one of the worst tours of any sort. They didn’t consider the tide. The location was from the rivermouth upstream through the middle of the lagoon in the Tamarindo estuary in full blazing sun and not even near the mangroves. Nearly no wildlife is stupid enough to hang around this area – it’s all up in the cool shade of the canals which we never got near. The guides didn’t say anything about the ecosystem – I don’t think they even ever uttered the word mangrove – they were just along to make sure we kept paddling and got back to the van in time. There are excellent kayak tours of the Tamarindo mangroves but they are provided by the independent guides based out of the Hotel Las Tortugas in Playa Grande on the north side of the mangroves. The mangroves backing Playa del Rey (south edge of Manuel Antonio national park) and Playa Matapalo are quite probably the best in Costa Rica. They are large, but not nearly the largest. It’s not size that sets them apart, it’s the amazingly clean Río Savegre that feeds them and the undeveloped beaches that front them. We took a four hour tour with Rafiki Safari Lodge which started with some easy class II rapids on the Savegre river, shore birds, monkeys, and even a few small crocodiles. 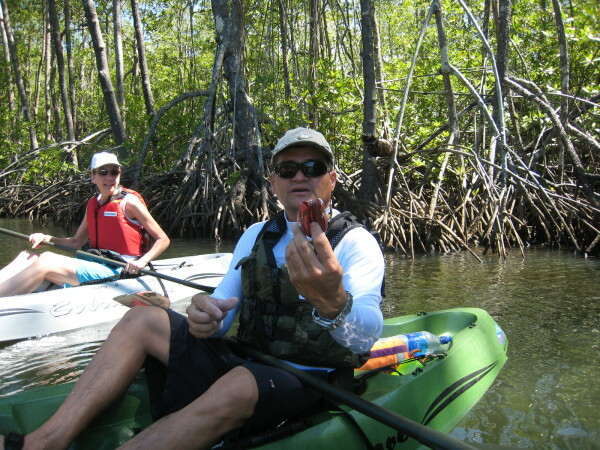 After a stop on the beach for a cold beer and some watermelon we rode the incoming tide into the mangrove canals passing through pristine examples of the red, black and white forests simply teeming with birds and wildlife. We finished by looping back out to the beach at the far south end of the mangroves to watch the sunset with an ice cold pipa in hand while the guides loaded the boats on the trailer. It’s a fairly long tour and if you’re out of shape you’ll definitely feel it by the end. There are no motorized options.